Many people who downloaded last week’s Windows 8.1 patch have experienced blue screens of death, and looping system restarts. In fact, the problem has been so significant, that Microsoft has pulled the patches from Windows Update. They also recommend that you uninstall them. In all, the problems have been associated with four patches, which aimed to address a number of issues. Aside from the symptoms associated with system instability, these could cause problems with any of your computer’s fonts in the event that any of them aren’t installed in the typical fonts directory in Windows. According to Microsoft, fonts that are installed anywhere other than “%windir%\fonts\” can’t be changed when loaded into an active session, and could spit out a “File in use” error message if you attempt to alter, replace, or delete them. These fonts can also render incorrectly. If you want to check and see if you have any of these patches installed on your Windows 8.1 PC, head over the the Metro UI and type “Programs.” Then, click “Programs and Features.” From there, click “View installed updates” in the upper left hand corner of “Programs and Features.” This screen will allow you to identify whether you’ve installed any of the updates that have been causing problems for Windows 8.1 users by matching them up with the identification numbers in the list above. We will be uninstalling Update 2982791 now. 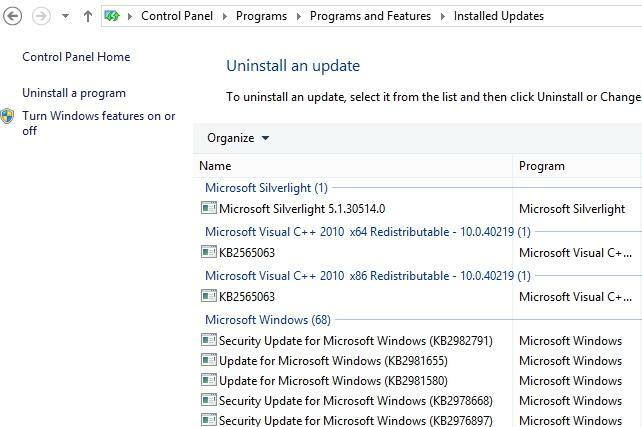 To uninstall any of these updates, just click on them, and click “Uninstall” towards the top of the window. This isn’t the only issue that Microsoft has had with its big-name software products. Microsoft acknowledged issues with Internet Explorer users experiencing extreme performance slowdowns, and has issued patches to combat the problem.